It’s summer of 2018. Since pulling up the stakes and moving overseas in 2012, Jenia and I have now lived in three different foreign countries, where I’ve taught in three very different schools. We’ve put together some tips for teaching abroad because we’ve had very mixed experiences, which have taught us some important lessons. We’d like to help you make well-informed decisions before taking the plunge and accepting a teaching job overseas. We start from the assumption that you’ve already gotten your name out there and have an interview lined up. 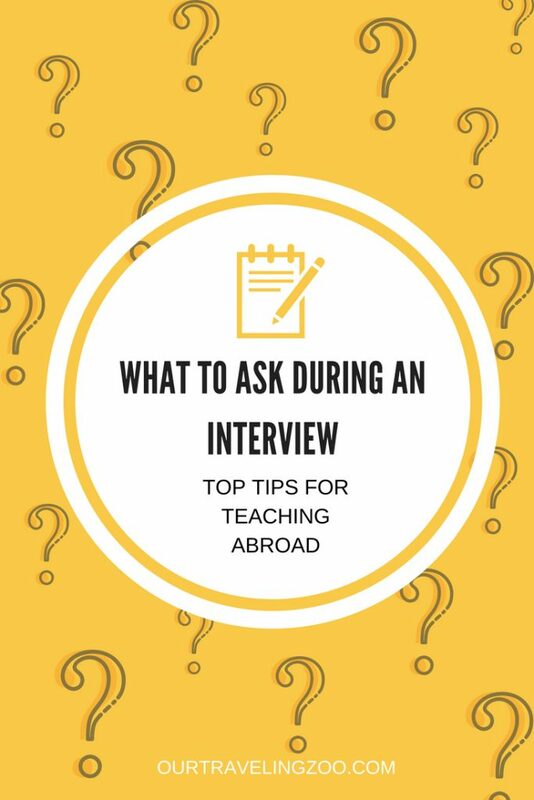 It can be hard to know what questions to ask as an interviewee, particularly if you’ve never lived or taught abroad before. What we’ve got here are tips to help you ask the right questions during your interview to teach overseas. 1. Ask about turnover rates. Avoid places with high ones, because those places have a problem, or else teachers would be happy to stay for longer periods of time. 2. Ask a follow up question regarding the length of teacher contracts. Find out if teachers leave before completing theirs. If they do, it’s another warning sign. 3. Go someplace established. Choose a school that has been around a while. Avoid new schools. While it may sound great–you can get in on the ground level and really help build the school–this doesn’t hold true. There will be tons of unexpected changes taking place, and that is hard to put up with. This said, sometimes new schools are willing to pay more as a way of compensating people for the tough time they’ll inevitably have, but the benefits can come at quite a cost to teachers’ sense of stability. 4. Ask the school to put you in touch with a couple of teachers for ideas of what the best and worst things about the institution are. 5. Ask about the benefits package. For a highly qualified teacher, you should get a solid benefits including annual round trip airfare to your home city, health insurance, and housing. I’ve never worked at a school which didn’t provide those three things for my family and me. Many schools include transportation to and from work, too, and/or incentives such as an end-of-service bonuses, or a retirement plan. 6. Ask if the school’s calendar changes. This sounds stupid until you’ve worked in the UAE or China and found that you can’t actually plan things because the powers that be will suddenly change the dates of holiday breaks. Sometimes by a day, sometimes by 2 weeks. Real story. 7. Find out how long the school day is and how many days are in the school year. As a teacher, how long are you expected to be at the school each day? Are you required to teach extracurriculars? Are you to expected to participate in events which take place after normal school hours? Some schools will expect you to be there a lot, so high pay may not end up so attractive with commensurately high hours. Also be sure you know how many days you’re expected to work during the year. Some places have calendars with 200 plus days of school a year. 8. Join some Facebook groups aimed at foreigners living in the area you’re considering. There are several about Shenzhen, for example, and we were members of several more in the UAE. These can be a great way to make some contacts and put your finger on the community’s pulse. Do this before an interview and you could be equipped with some fodder for conversation you’d otherwise lack. 9. Beware of outliers who trash a school. If you go online and find some negative feedback about your prospective school, take it with a grain of salt at first. There are disgruntled teachers who complain and complain, but they’re often the sort of people who would complain and complain about any job anywhere. If you continue your research and find out that the school or organization has treated many employees badly, then of course you should take that seriously, but until then, don’t get too worried. 10. Stay patient! This applies both during the job search and after you take an offer. Speaking of which, if you accept an offer, be aware that you’ll have lots more work to do before you can actually pack your bags and get on a plane. There’s a lot of paperwork to be done, and that process can be stressful if you let it be. When it comes to asking the right questions in an interview, these are our recommendations. These questions will help an interviewer know that you’re serious about teaching abroad, and that you’ve done enough homework to know what is important to ask about. If you put all these tips together and read a bit between the lines, you’ll figure out that we’ve found a stable environment to be very important, because living abroad we go through a lot emotionally. We think if you keep these things in mind, you’ll have an easy time sorting out which jobs you should consider as you search for work abroad. If you’d like to read more about teaching abroad, check out this article from TopUniversities. If you’d like to learn more about Shon’s interview process for the UAE job, head over here. Are you a fellow teacher who is living and teaching overseas? What do you consider the most important things that job hunters should bear in mind? Have you got any top tips? Let us know in the comments below. Great pointers! Because I have school aged children, I ask questions such as: Is tuition covered for my kids? If so, for how many kids? Some schools cover only 1 child per teacher. Also, how diverse is the school population? It can be hard if your child is the only English speaker. Living overseas can be trying for the whole family at times, so ask questions about other teachers with families. See if you can contact them to ask about family life. Good luck and trust your gut feeling! Awesome advice, Ashley! Those are definitely things a family should ask. What a great article! I haven’t taught abroad but even finding a new job is daunting enough. Knowing what to expect and what to look for is so helpful especially when there are always those negative ones on the internet.